A message from Robin Stevens!! After starting up this blog, I thought that it would make sense to create an @misstrecommends Twitter account so that I can follow authors, reading charities etc to get up to date knowledge on current children’s books, ideas for teaching and so on. At the same time, I am tweeting my blogs so that anybody can have a peek, or if parents want to follow me and keep up to date with what I’m reading, then they can. Anyway, I tweeted my blog from this morning about my trip to Waterstones and picking up two books, one of which is written by Robin Stevens. I included her Twitter name and started following her so I could get info on her fab books (she is getting things ready for her next book in the Murder most Unladylike series) and you’ll never guess what?? She actually wrote back with her thanks and retweeted my blog!! I’m so chuffed! What a nice lady! Don’t forget that social media websites have age restrictions. If in doubt, ask an adult. E-safety is very important. 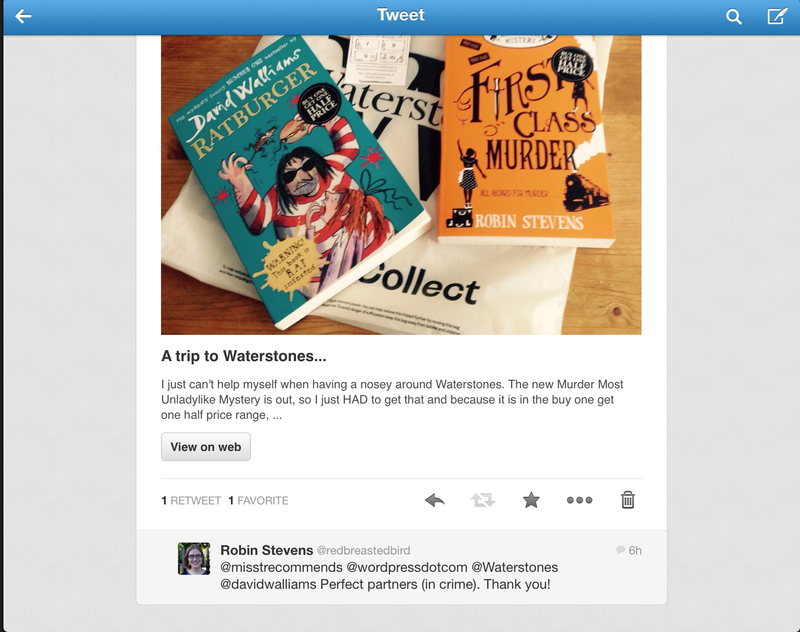 I’m glad your enjoying the Murder most Unladylike book – I’ve got two more for you after that! Hello, I haven’t read the Murder Most Unladylike books. Do you think I should give them a try? Give it a go! I know you like a mystery and old fashioned kind of writing like Blyton. This could be right up your street. It’s set in an all girls boarding school where it’s all a bit ‘jolly hockey sticks’ and ‘tally-ho’ but I quite like that. I know that Ella has read the series, why not ask her for her opinion? Let me know how you get on with if you start to read it.